One year ago, I wrote a series of articles for Wisconsin Opinions that discussed the massive revisions in custody and placement laws enacted by the Legislature as part of the state budget bill. In those articles, I discussed how the genesis of the legislation was a desire by gender-based advocacy groups to mandate equal placement of children in virtually all circumstances. In the end, then, the effect of the legislation will be up to each individual judge. If the courts treat this legislation as a move towards gender equity, it is examining the rights of the parties, not the child. If the courts treat this legislation as continuing Wisconsin’s historical focus on the best interests of the child, without regard to the gender of the parents, then the many hours of hard work put in by all groups who arrived at this compromise will have been well spent. So, one year later, what has been the effect of this legislation? Have courts promoted the rights of parents over the rights of children, or has the legislation had little practical effect? Anecdotal evidence indicates the answer is somewhere in between the two extremes. Certainly, the law has been a source for some confusion. 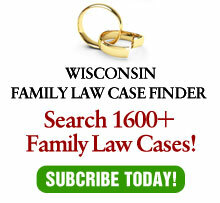 In May, I addressed the Wisconsin Family Court Commissioner Association on this very issue. While my opinion – that the law does not mandate equal placement – was forcibly stated, clearly not all commissioners agreed. Several questions and comments made it evident that certain family court commissioners felt that the law was an impetus toward splitting placement equally in more cases, if not in every case. On the other hand, anecdotal evidence from lawyers indicates that this belief is not universal. Indeed, one of the factors added to sec. 767.26 requires a court to consider the “The amount and quality of time that each parent roles has spent with the child in the past…” Wis. Stats. Sec. 767.24(5)(cm). This factor can be effectively used to argue against equal placement, especially in those frequent circumstances where one party assumed the primary caretaker role prior to the commencement of the divorce action. Mandatory parenting plans when custody or placement are not settled by the pretrial is another significant change enacted as part of this legislation. Other than counties where parenting plans have been in use for some time, anecdotal evidence is scarce regarding the effect of this requirement. No instances have been heard (yet) of courts ruling on placement issues due to a party’s failure to file a plan, and some judges have proved themselves to be flexible regarding the timing requirement. Nonetheless, it appears that the parenting form requirement may have two salutory effects. First, as intended, it will force parties to think about certain issues, such as day care and recreational activities. Second, while not the primary intent, making parties think about these issues prior to the pretrial may induce settlements of custody and placement issues which, if approved the court, are enforceable at the time of divorce, pursuant to Keller v. Keller, 214 Wis. 2d 32, 571 N.W.2d 182 (Ct. App. 1997). This could avoid one of the horrors of divorce litigation: the last minute adjournments as one party refuses to agree to custody or placement on the day of trial. One issue left open by the new legislation remains unsettled. With Guardians ad litem constantly under attack, the Legislature referred the issue to a Legislative Council Study Committee to formulate recommendations to the Supreme Court for modifications to Wis. Stats. sec. 767.045. This committee has only just begun its work. Fortunately, the State Bar of Wisconsin was able to place two experienced Guardians ad litem, Cheryl Gemignani of Phillips and Gemignani in Waukesha and Susan A. Hansen of Hansen, Gagne & Foley in Milwaukee, on this committee. They will add not only the voice of experience, but also serve as a balance to the expected witnesses who tell anecdotes about when GALs may not have done a good job. With their guidance, it is anticipated that the study committee will not recommend any substantial changes to sec. 767.045. There is some anecdotal evidence that courts are taking the placement enforcement injunctions statute, Wis. Stats. sec. 767.242, seriously, and I have heard at least one instance of a modification of placement utilizing the “use it or lose it” provision of the law. Fortunately, I have not heard any stories of abuse of the injunction procedure, one of the great fears arising from the legislation. In summary, while the jury is still out on whether these changes are more positive or more negative, the net effect appears to be that the legislation has not changed the world of family law as we know it.